Preschool Playbook: Productive Parenting: A Wonderful Site! I was recently contacted by Susan from Productive Parenting. She asked if I would share her site with everyone. To be honest, NOT to share it would be a crime. 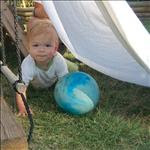 It is a wonderful site full of fun activities for preschoolers, toddlers, and baby development. To access all the great information on the site, one must sign up, but it is free. The activities in the library are arranged by age. One can also view the skills the activities will help develop. Plus all the activities are categorized into six different areas: Daily Living Skills, Exploring Our World, Fun with Numbers, Language/Pre-Reading, Science Adventures, and Sensory Experiences. All activities have easy preparation and materials. Children love having a space all to themselves! Have fun today creating a new space for your child to enjoy. Put a sheet over tables and chairs to create a 'tent.' Put your child's favorite toys and books in the new space. Watch the fun your child will have exploring in and out of the new space! Locate a large cardboard box, (with the sides open), for your child to enjoy. Maybe you and your child can spend special time together today enjoying a snack in the tent. Encourage your child to look outside and describe the weather. If today is a sunny day, have your child take the picture of the sun and put it on the refrigerator door. Make this activity part of your child's daily routine. Your child may enjoy being a weather forecaster! This activity is fun to do at night or in a dark place in your home. Play the "Flashlight Game"! Shine your flashlight on the ceiling or wall. Have your child try to catch the light with his/her light. Continue with the activity having your child try to catch the light from your flashlight. 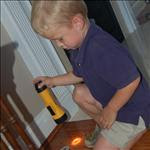 Another flashlight game to play with your child is before bedtime, when it is dark. After cleanup time, go to a dark room and let your child be silly. Track your child with a flashlight, while running around. This fun matching activity will be provide a snack for today as well! Take all of the animal crackers out of the box and turn them right side up. Have your child choose a cracker and find another one that matches exactly. Put that pair aside, then continue to find matches until all the crackers have been matched or you have an assortment left that don't match. Have fun eating all the lions, all the elephants, etc.! Introduce your child to this fun number game: "Dice Addition." Have your child roll one die and count the objects. (If the die indicates 4, have your child count out 4 pennies.) 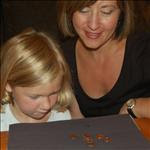 Have your child roll the second die and again count out that many pennies, (or other objects). Combine both sets and count them all to get the total number of pennies, (or other objects). If your child seems interested, you may want to write the problem 4+3=7). You can also make your own large dice with boxes covered in white craft paper with dots indicating the numbers. Remember, this is just a sampling of the activities. The above samples are one from each age group. Each age group is also subdivided into early, middle, and late stages of each age. The possibilities here are endless. If you are looking for a site to offer some additions to all the wonderful things you already do, be sure to check this site out. whoa buddy! thanks for sharing! Alright! I'm going to check it out. Looks like a great resource! Wow, what a great site. I've already signed up and look forward to using it and receiving my activity emails. This is great. I'm always on the lookout for more activity ideas. I've already signed up and can't wait to look through all of the activities. Wow that's great! going right now! Please let us know how we can continue to develop Productive Parenting to meet your parenting needs! We are passionate about encouraing and equipping you to be the parent you want to be!